This brush set is a themed set for helping you wish that special someone a very happy Valentine's Day! 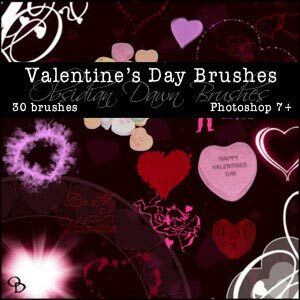 Download the Valentine's Day Brushes! 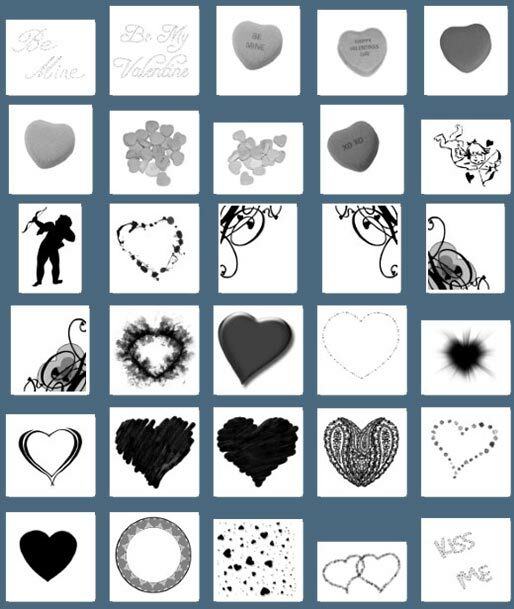 **If you are using an earlier version of Photoshop than 7, you can download the images used to make up the Valentine's Day brushes. As a special bonus, I'm also making available this colored PNG of some scattered candy hearts. Enjoy, and have a very happy Valentine's Day! Want More Free Photoshop Brushes? We've collected the most recent of Stephanie's original brushes on a special Obsidian Dawn Photoshop Brushes Page, with big preview images to give you an idea of each set. For her high resolution brushes, you can find a special collection on our high res brush page. Also see our Free Photoshop brushes Page for other places to find brushes.